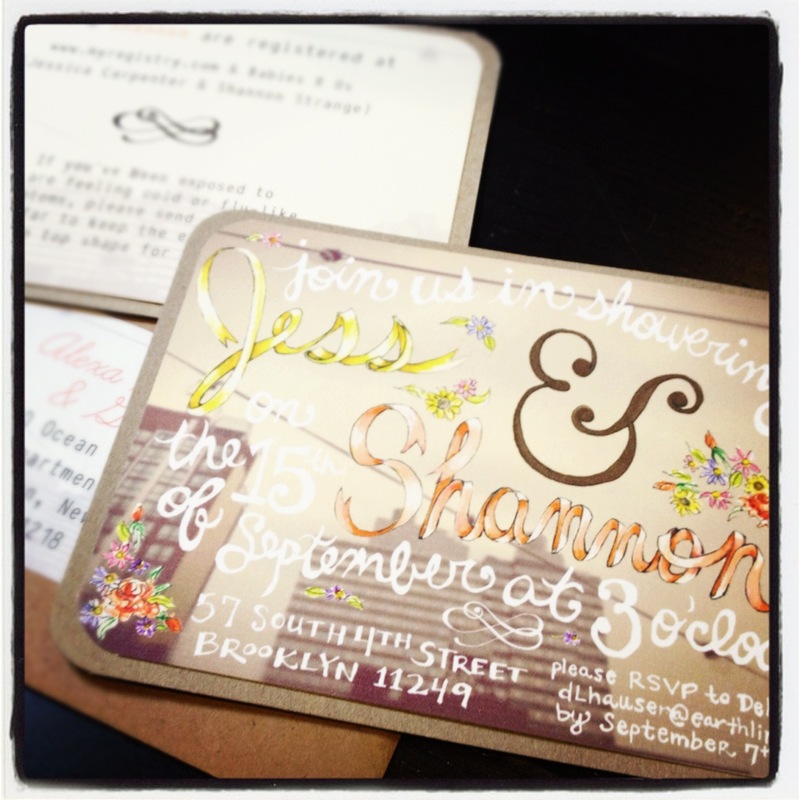 The invitations are out…so now I just have to plan it! As I started to plan my third baby shower of this year, I realized that I should share a bit of my process with the world since I have party-throwing down to an art form! If you don’t know this already, soirees of all sorts are kinda my thing, from my own wedding to showers to our annual Easter and Christmas parties. They all get the same attention to detail and I use the same paperwork for every single one. My famous (within these 4 walls) party charts are after the jump! I start with an estimate for the number of guests and what I want to cook. I include everything in the list, even water, so nothing is forgotten on the day. Next to the food or drink is the list of ingredients which can easily be turned into your grocery list with a little more organization. The next column is what you need to serve that particular item. If you are throwing a shower with other hosts, each person can see what they have to make sure you are all covered for serving ware. The prep column is for you to figure out what can be made ahead and if you’ve chosen too many foods that go into the oven at the last minute. 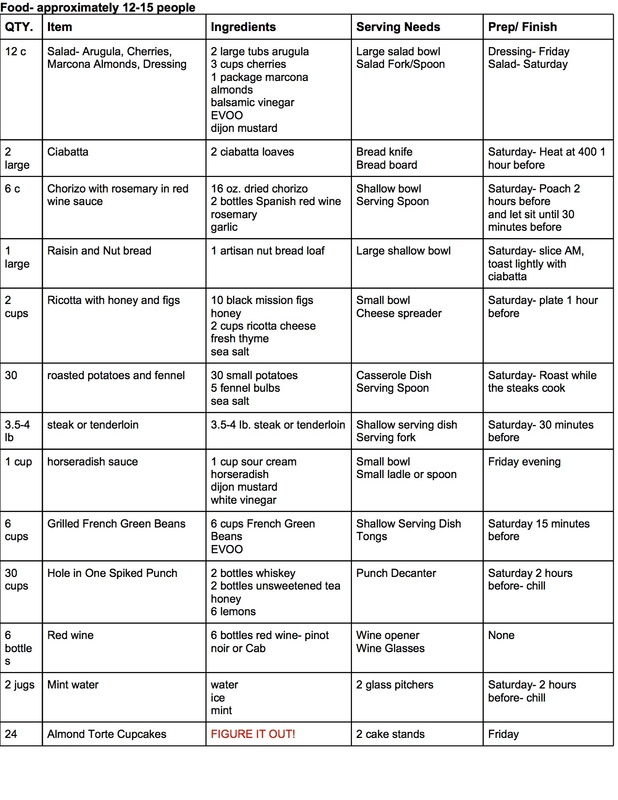 This may seem a little obsessive, but trust me, when you have a lot to plan, it’s better to get it into a chart and out of your head! 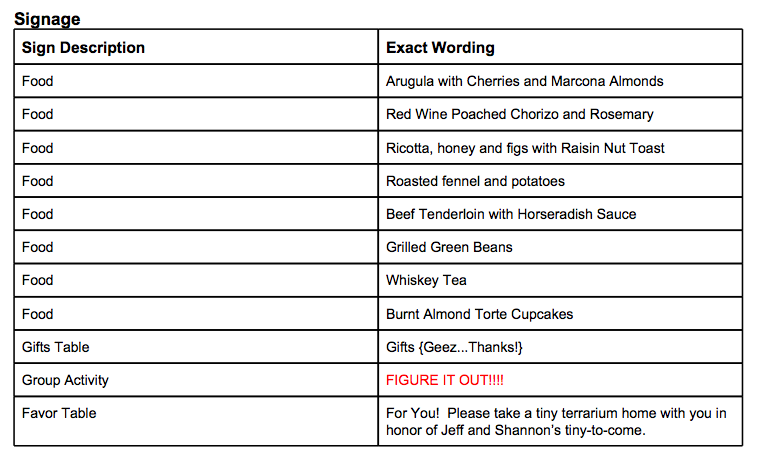 The next chart is for the signage around the party, from the food to the gift table. Larger parties tend to need more signs than small ones, but I always label the food for a buffet so I don’t have to spend the whole time explaining what everything is. As I decide on an activity or shower game or food item, I add it to the signage list so I don’t forget when I get around to typing them up. Click here to see some signage from a baby shower I threw! The trimmings chart can include everything from plates and cups to party favors and decoration…this is your opportunity to get everything on paper so you have a way to check it off! If you want, you could even include music as a category with some specific artists or ideas in the other column. Finally, my guest chart comes in handy from the very beginning of the planning to the weeks following the event. Next to each name and address for the invitations, I include a column for their response and another for gifts so a description can be jotted down. On one piece of paper, you can see who gave you what gift and their address is already right there! 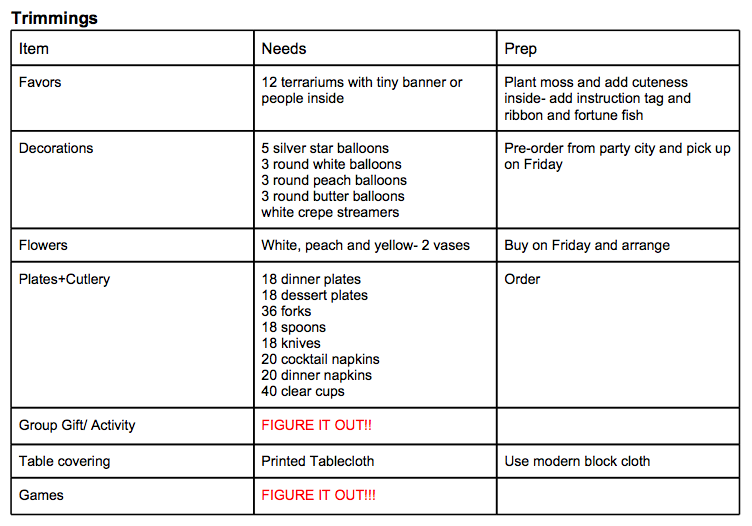 Okay…now that I’ve broken it all down for you and given away my planning secrets, go throw yourself a big old party! You’re so cute. Wanna come work for me? Pingback: The Kardashian Calculator, Florissant Missouri, Fall TV and Precocious Black Girls Were All Caught Procrastinating on This!